Driving into Santa Barbara, we felt like we were driving into a massive country club. Setting up the classroom, it really got to me the hollowed ground of the school – it was the home of the legendary UC Santa Barbara Burning Skirts, the team of Briana Cahn, Lisa Pitcaithley, and Carolyn Finney. We had a discussion on identity and power, and explored who has a one-up privilege in the ultimate community and who doesn’t. pics from the day on my phone? We then discussed next steps in bringing equity to the community, and how something so simple such as a Twitter handle can be changed to increase how we share information. 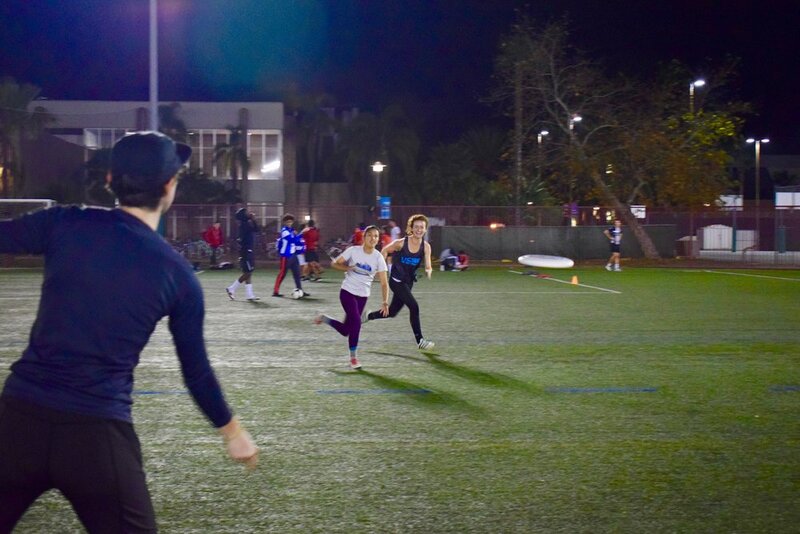 For example, the Black Tide, UCSB’s men’s team, uses the Twitter handle, “@UCSB_Ultimate.” Although they use the seemingly gender neutral term, they don’t share any information on the women’s team. Afterwards, we went outside and had a clinic and scrimmage with the local community. We also got a chance to meet Tricia Guilfoyle who was a former Condor before she helped found the Burning Skirts in 1988 and then win a National Championship in that same year. She brought out some of her middle school students that she coached who are now high schoolers to play in the community scrimmage and it was great to get such a wide range of players out from beginners to experts to run around outside in warm Santa Barbara!